Take it as given that any short film festival program will feature a diverse range of approaches, and that most will connect with someone but few will connect with everyone. That must be especially true of short films with a religious theme, as a person's response will largely be determined by the substance and form of their spiritual beliefs, as much as it is determined by their taste in films. Father Christof Wolf SJ, director of the second Iñigo Film Festival, held this week as part of World Youth Day celebrations in Sydney, told Jesuit news bulletin Province Express the festival focuses 'on young filmmakers who grapple with the spiritual dimension of life'. That's the mandate. What are the results? Predictably, varied. Given my opening disclaimers ('different strokes for different folks'), in this review I'll simply point to a few of the more interesting highlights of the festival program. Humour, when well executed, is an effective tool for communicating to a broad audience. For the young heroine of Under There, a condescending stranger's feeble attempt at explaining the concepts of 'soul' and 'heaven' can't compete with the sheer joy of kicking a soccer ball playfully against her deceased brother's gravestone. Her simple belief that her brother is now living happily 'under there' is all the understanding of death that she needs. For my money, surreal touches always appeal. In La Liberté de L'Intérieur, a prisoner discovers a magic means of escaping his tiny, drab cell. Once outside, he's free to share the key to his liberation with the prisoners of other similar cells. What the 'key' symbolises — presumably a religious or political ideology — is open to interpretation. Film is rarely an effective medium for proselytising. Moral messages are best communicated if a film's focus is on story and character. Cocoon, in which a professional dancer muses upon her unplanned pregnancy, is patently 'pro-life'. But its lyrical rendition of the central character's emotional journey and the actor's internalised performance make it a humane and non-judgemental contribution to conversations about abortion. Not all of the films address spiritual themes as obliquely. In Un Éclat (The Sparkle) a widower burdened by 15-year-old grief experiences a turbulent spiritual reawakening after performing a reverent restoration on a piece of religious art. The film reveals the power of symbols to connect minds and hearts with a sense of the divine. Religious iconography also plays a central role in this reviewer's 'pick' of the festival line-up — the animation The Judas Pane (pictured). 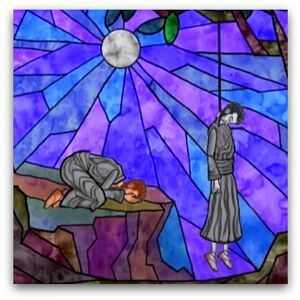 The Judas figure in a stained-glass tableau, cast forever as a scowling villain by the artist who created him, obtains absolution after witnessing the depiction in a separate pane of his doppelganger's notorious role in the passion story. It's a funny, clever and poignant twist on a simple redemption story, which plays upon traditional understandings of the gospels while critiquing the subjective role of artists in depicting religious icons. Festival screenings take place Thursday 17 July at Loreto Kirribilli from 7pm to 10pm. The three best films will be announced at an awards ceremony on Friday 18 July at 2pm. Would that the Kirribilli experience were available in Melbourne at a time and place suitable to our vast audience! There's more silver in my teeth .. than in our trophy cupboard .. Gravestones bear witness to our only premiership .. Every year we leap for the heavens .. and flop in the gutter .. My football team is hopeless.